The Salomon Ultra Pro ($150) is a relatively svelte 8mm drop shoe (24mm heel/16mm toe) which provides firm cushion and support to my feet over both short and long trail runs. Though created in the vein of the S/LAB Ultra, which iRunFar reviewed in June, the Ultra Pro is oriented more toward a ‘mass’ audience and being a shoe that can go more miles on more people’s feet. 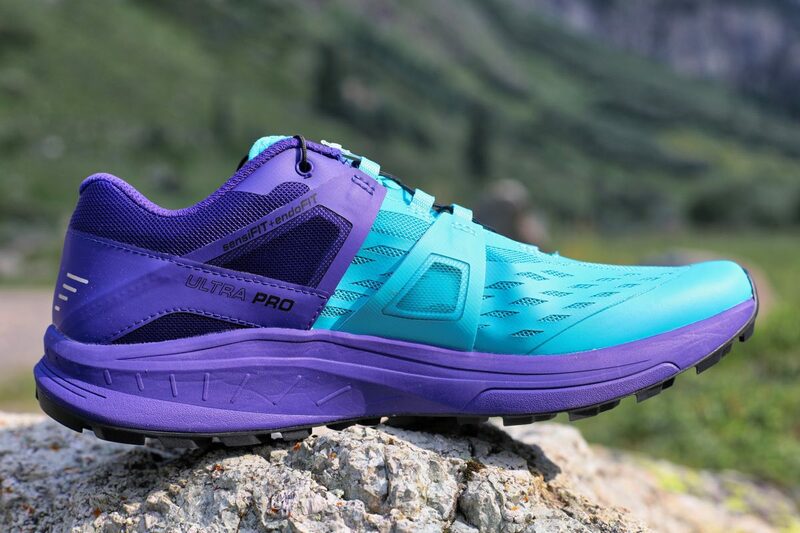 The goal with the Ultra Pro is still performance, and it weighs in at 8.8 ounces (251 grams) in the women’s size 7 and 10.3 ounces (292 grams) in the men’s size 9–a bit lighter than the S/LAB Ultra. These weight savings come from the absence of a rock plate and lighter mesh materials throughout the upper. In my 200-plus miles in the shoe, I’ve found it functions perfectly well when the trail conditions and terrain are moderate whether dry or rainy. The shoe feels light on my feet and was as perfect for a recent rolling dirt trail half marathon as it was for well-established trails in the Rocky Mountains earlier this fall. Though the Ultra Pro comes in men’s and women’s sizing, I find that it fits a bit long (maybe a 1/4 of a size larger) compared to my other women’s-specific Salomon’s shoes and has more of the unisex feel, which means it doesn’t fit my foot quite as snugly as I have come to expect from Salomon. That being said, I do find myself choosing the Ultra Pros frequently these days as I run flow-y, lower-altitude trails with the onset of winter up high, and if I had an upcoming 50k, they’d be in the final running for my race shoe of choice. The Salomon Ultra Pro. All photos by iRunFar/Bryon Powell unless otherwise noted. 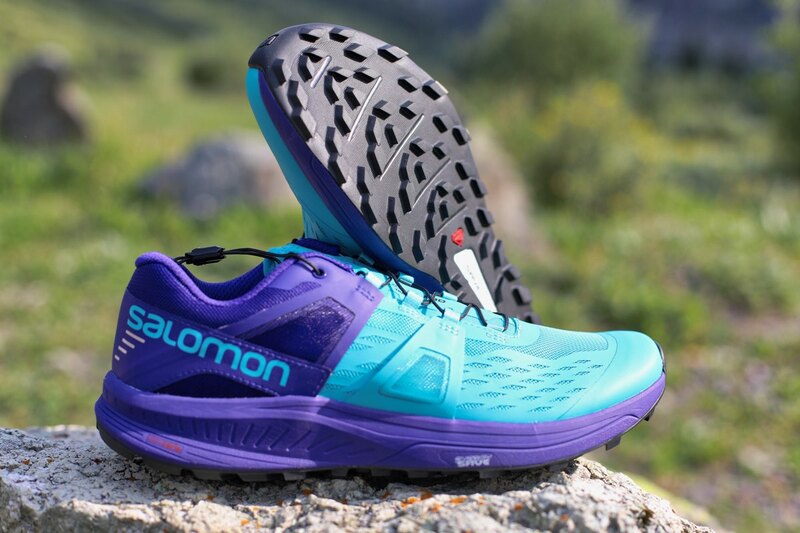 The community buzz is that the Ultra Pro is a wider shoe than others in the extensive Salomon line-up. While I agree it’s wider than some, it’s not, by any stretch, a wide shoe. For instance, the Ultra Pro is about a quarter inch wider at the widest part of the forefoot (women’s size 8.5) compared to the Speedcross, but the heel is about the same width. The overall volume in the toebox is what I’d call medium-profile volume, but part of the ‘medium’ space may be due to a more accommodating upper material with thinner overlays. The upper is constructed from hydrophobic 3D stretch air mesh with thin, welded Sensifit overlays medially and laterally over the midfoot and forefoot. These integrate into the substantial rand, protecting the entire leading aspect of the foot, which is further reinforced with the outsole coming up over the front of the shoe centrally. What does all this mean functionally? For a lighter-weight shoe, the protection at the front is fantastic—rocks and roots are not really a concern if you happen to greet them with unintentional fervor. Unique and specific to the Ultra Pro (and S/LAB Ultra) are the dual pairs of external Sensifit wings that wrap up from the midsole/outsole junction and integrate with the speed-lacing system via wrapped plastic grommets anchoring the laces. The wings on the Ultra Pro have mesh windows for increased breathability and moisture management, which speeds water drainage when the shoes get soaked. The upper does indeed dry faster and feel cooler than the Speedcross, but I find that even when wet, they still retain their comfort and performance. At first, I was a bit of a skeptic about the external wings, but beneath them, the large-pore mesh has very little structure even with the welded overlay pattern. The Sensifit wings do provide valuable medial and lateral wrapping support; I’m just not used to seeing that support sitting on the outside of my shoe. The only real drawback to the flaps is when significant ‘peanut-butter’ clay-mud is involved. The mud can squish its way behind the wings’ leading edges as the shoe torques and flexes, creating some odd pressure points until it oozes away. Overall, once the shoe is laced and you’re running, it’s easy to forget from whence the support comes as the foot is held securely in place. The Endofit’s gusseted tongue is thinly padded, firm, and cut flush with the upper near the proximal eyelets. It provides just enough padding beneath the laces to protect the top of my foot, but I wonder if more padding might be desired over 50k to 50 miles. A bonus to the low-profile tongue is that it doesn’t soak up much moisture and dries quickly. This prevents the shoes from feeling heavy in truly inclement running and racing conditions, which is always helpful. Lastly, on the tongue is the hallmark speed-lace garage, but this time, it’s a top-loading garage for easier stowage. I know many people love this feature, but I find it easier just to hook the end of the long speed lace under the horizontal lace near my toes and call it good. As I’ve come to expect from Salomon, the heel cup is firm but somewhat flexible and well-padded for comfort but not to excess. It locks in my narrower heel perfectly and doesn’t at all irritate my Achilles tendon. Coupled with the support from the external wings and the solid lacing system, the fit of the Ultra Pro lives up to Salomon’s ‘locked-in’ reputation… mostly. If I had one point of slight frustration, the extra length of this shoe does result in a sloppier forefoot fit than I’m used to as the mesh and overlays tend to gap and crease just outside the medial aspect of the ball of my foot. This results in the occasional blister on one foot, which I don’t typically have with other Salomon shoes. This is nothing a strip of tape can’t solve, but I’d prefer not to have to do that at this price point. 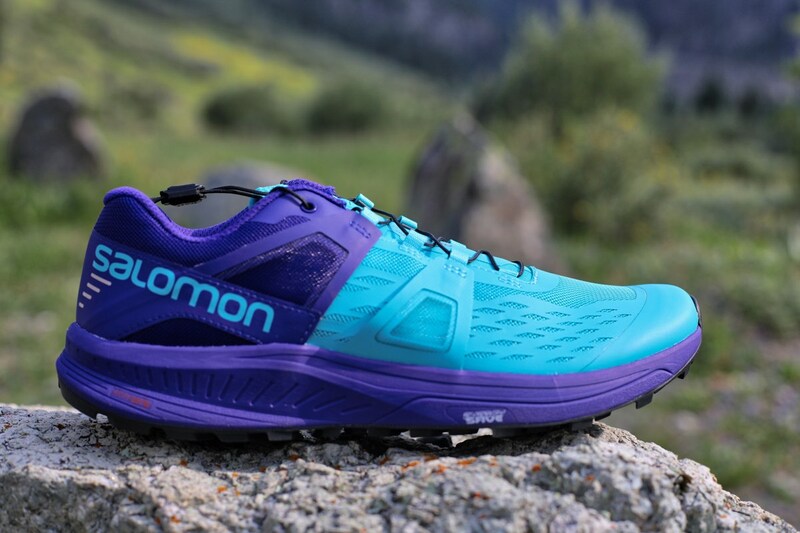 The Salomon Ultra Pro lateral upper. The midsole features dual-density EVA throughout, along with the TPU Energy Save insert that extends from the forefoot to the front of the heel section of the shoe. The purpose of this insert is to offer more cushioning over longer miles while facilitating better energy return. These shoes feel somewhat firm like so many of the S/LAB shoes do, but there’s definitely more resiliency in the midsole that translates into a more comfortable ride on harder surfaces without any type of marshmallow or bouncy effect. It’s this aspect of the Ultra Pro that makes it possible for me to be comfortable over 20 miles and no doubt at least up to 50k even on really hard-packed dirt with a decent amount of vertical. I have a body that requires more cushioning than most shoes this weight have, but the Energy Save insert is a winner in this aspect. Surprisingly, there is no rock plate or film in this shoe. I thought I’d miss it more than I actually do, thanks to the TPU/EVA combination midsole and the fact that the low-profile lugs mean I don’t wear this shoe on gnarly, rocky terrain. It seems like there would definitely be a market for an Ultra Pro shoe with a thin rock-plate option… maybe on an ‘all-mountain’ version. The Ultra Pro utilizes the tried-and-true Premium Wet Traction Contagrip, which is a pretty incredible compound that offers excellent grip on wet rock, roots, angled rock slabs, and more standard trails. Interestingly, on this shoe and much like the S/LAB Ultra, they’ve chosen low-profile, 5mm, diamond-shaped lugs of varying sizes and directions running the full length of the outsole with the exception of a small window over the central arch where the Energy Save midsole is revealed. While these small lugs provide excellent traction and purchase on moderate terrain even at higher rates of speed, the absence of aggressive lugs like those found on the Speedcross or Fellraiser leaves the traction distinctly lacking in snow, slick grassy hillsides, rubble-strewn slopes, or Pacific Northwest mud. On the positive side, I discovered firsthand that the decreased depth in the tread pattern makes them excellent at shedding stackable clay-mud when a big wintry-mix storm moved in halfway through my recent trail race—those lugs just don’t pick up much clay and it flings off nicely and relatively uniformly. The Salomon Ultra Pro outsole. Full disclosure, I have a Salomon-type foot and a long love affair with Salomon shoes in general, so this is yet another shoe I’m really impressed with and happy to wear each week when I want to feel ‘fast.’ For those of you lighter on your feet than I, this is a shoe that can truly go the distance—maybe any ultramarathon distance. For me, it’s a solid 50k shoe and possibly a 50 miler if the rocks and technical-terrain sections are few. 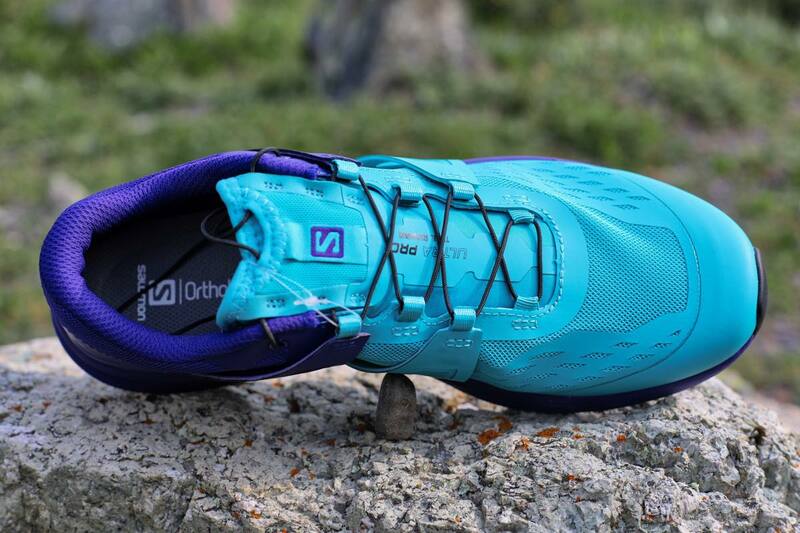 I like that Salomon took a true high-performance S/LAB lineage shoe in the Ultra and made it a bit more accommodating to those of us who prefer more cushioning and midfoot wrap with the Ultra Pro. I’m not sure people much outside of normal widths and low-moderate foot volume will be able to fully appreciate this shoe, however, since it doesn’t stray far from the Salomon pattern, but for those who find themselves just outside the Speedcross soccer-boot fit, the Ultra Pro offers more volume, a bit more width, and definitely more flexibility in the upper. So, kudos to Salomon for expanding the width even a bit. Hopefully they’ll continue to listen to feedback from so many ultra-trail users out there and begin offering varying widths in some of their higher-end, performance, ultra-trail footwear. Have you run in the Salomon Ultra Pro? If so, what is your overall opinion of the shoe? Have you tried both the S/LAB Ultra and the Ultra Pro? How do the two models compare for you? For what run or race distance do you feel comfortable using the Ultra Pro? Can you run ultra distances in it and does it still maintain a performance-oriented feel in both shorter and longer runs? I ran my first 100 mile race in a pair of ultra pros that I had put just 20 previous miles on! Brave/stupid, I know, but they just felt that good. At the end of the race, I had all of my toenails and only one blister, which I view as success. I find them to feel slightly wider than other Salomon shoes and had to size down a half size, which is a first. I did catch the external wings on a sneaky stick once resulting in quite a spectacular fall. Outside of that, they are my favorite every day and long run shoes for the CA Bay Area. The only time I reach for a tighter fitting more locked down shoe is on steep shale mountain descents, where I find I want a bit more security. That’s fantastic, Anna! Bummer about the fall—epic for sure w that mechanism. I did wonder about dropping a half size but my lateral half of ea foot appreciates my current size. Thanks for commenting w your experience! Great review! I’ve put about 150 miles on my first pair and at first found them a bit too light and not cushioned enough (I was in love with the Salomon Wings Pro! ), however after 30-40 miles they’ve now become a great shoe and feel more comfortable than at first. They do fit big and next time I’ll probably go down 1/2 a size. I still miss the Wings, but the Ultra Pro has been a pleasant surprise! How are you finding the wear on the outsole? I have the S/Lab Ultra and wore them out in 300km… So, I am hoping these last a little longer. At 200+ miles, I have very little wear at all and nothing particularly uneven. The lugs and mesh are holding up really well and have been in all types of weather and crazy mud. I also sized down a half size if it helps anyone. I’m a US 10 in pretty much every Salomon (and most other brands) and a 9.5 in the Ultra Pro fits me great. I can see this shoe being a good one for most any ultra distance and my only reservation is that I had issues with the lateral collar hitting my ankle (lateral malleolus) during runs with sidehilling/off-camber technical trails. I thought it might be a one-off, but had the same issue with a second pair. Bummer for me, as I believe this is one of the nicer “quiver-of-one” offerings currently on the market. I still run in and enjoy my first pair of Ultra Pros, but know their limitations for my intended use. If it wasn’t for the ankle issue, I’d certainly pick these for 50-100 milers. So I am pretty currious about this shoe having owned the S/Lab Ultra. I see it doesn’t have a rock plate and am curious if it handles Rocky terrain as well as the s/lab version or if you can feel more of that poke through as I was surprised by how well the s/lab version handled that which helped on 40+ mile excursions/races. Anyone ran in both on Rocky terrain? I hope someone can answer this for you who’s run miles in both. I think this one works fine when I’m on rounded or slabby rocks–it’s the pointy ones that seem to get through given the lack of rock plate and the fact that the lugs aren’t particularly large or super close. How does this shoe compare to the Sense Ride? They seem VERY similar with the Ride having a rock plate, being a hair lighter but similar stack heights and outsole. Any trail shoes with 8mm drop for wide forefoot people? I have put in 130 miles on my Ultra Pros including the WAM 55k which was running all day though rain, snow, and mud of Whistler. They were fantastic! I have also used them for shorter & faster races, just as great. I do not notice the lack of rock plate despite running on many rocky & technical trails. The only problem I have had with traction is on wet and thick tree roots that are on steep descents here in the PNW, but that has been the case with every trail shoe I have ever worn. Also I have put on over 700 miles and multiple ultras over three different pairs of Sense Rides and still really like that shoe. I do think my feet better over longer days and miles in the slightly softer Ultra Pro and it will be my choice for the 2019 ultra season. I ran the Leadville 100 in these. No blisters all day and a nice casual ride. I have had issues with Salomon shoes in the past being too firm and hurting my feet (Pro 2s and Sense 5 SG), but these have been excellent from the first mile. These are not “go fast” shoes, but are more comfortable for longer distances. I find myself choosing these for almost every trail run. I ran UTMB in ultra pros in 2018 and they performed flawlessly. I did however also silicon coat my toes as well. I found the lugs provided the right amount of grip on the sort of mild technical terrain that the UTMB offers. On the large grassy/pathy downhills they were absolutely ideal. The downside of these shoes is that they do not offer a waterproof or more water resistant version and that the ultra pros tend to get very very wet inside. Step in a puddle and in a few hours you will have blisters and other nasties. 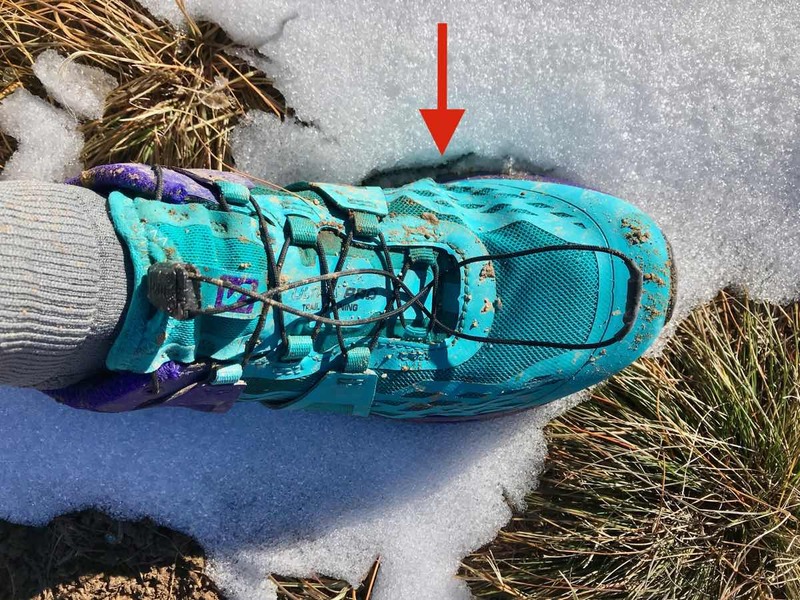 I agree with the author’s call for an all mountain, or more specifically, all weather version with the large toe box but also features like a rock plate and goretex. i’ll take an extra ounce of weight for that. 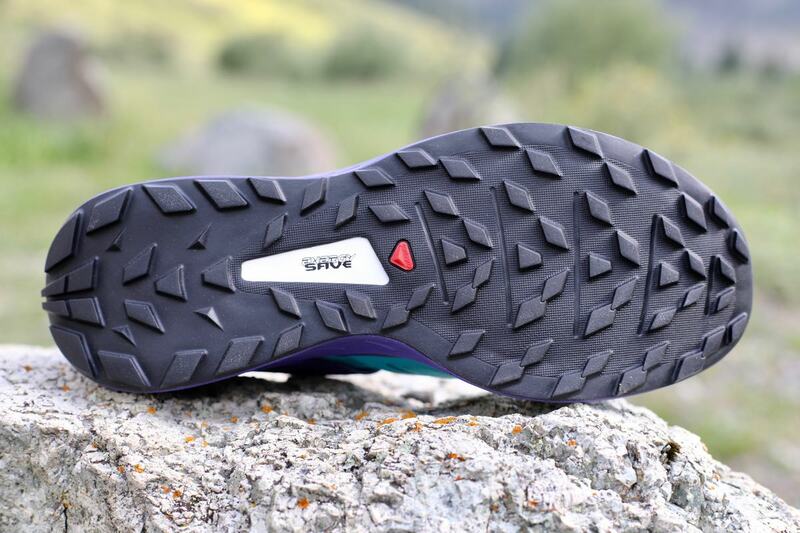 Ted asked about XA elevate: i am not an expert by any means and havent tried the XA elevate, but my understanding is that that is a much narrower shoe, especially at the toe. night and day from that standpoint.